This question, if asked by someone who hasn’t had the good fortune to learn one of these two languages, derives from the simple recognition that both languages use Chinese characters: 汉字 (“hanzi”, in Chinese) or 漢字 (“kanji”, in Japanese). Although this question is based on a rather limited premise, there is however a thread between the two languages that ties them inseparably together. The first common aspect of the two languages are the nouns. A noun, as you already know, is a word that designates something and could also be called a “name”. Nouns – in Chinese, as much as in Japanese – do not have gender (feminine or masculine) or number (singular or plural). For example, the Italian words “gatto”, “gatta”, “gatte” and “gatti” (cat/s) all correspond to the Chinese word 猫 (mao) and the Japanese 猫 (neko). This common aspect of Chinese and Japanese render the nouns in these languages easy to use (because they don’t change), but complicated to interpret (because you absolutely cannot know the gender or number – you’ll need to look at the phrase’s context). As described in the proceeding section, both languages use the same character to identify the concept of “cat”, even if the pronunciation is different. Up until the IV century after Christ, the Japanese didn’t have their own form of writing. 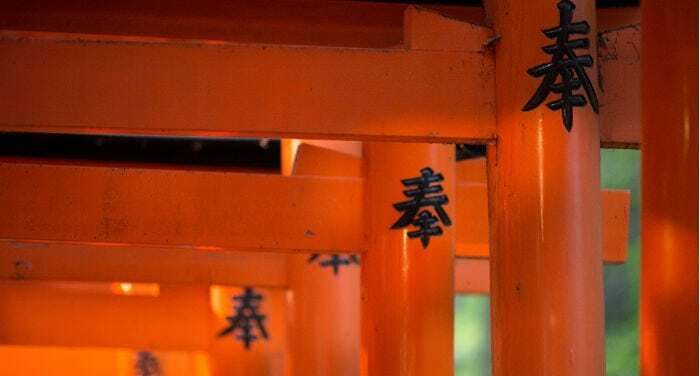 It was in this period, through the Korean peninsula (a small curiosity that I won’t dwell on in this article: about 60% of the Korean lexicon comes from the Chinese language), that Chinese writing broke into Japan in the form of tracts on Buddhism and philosophy (even if it would be better to say “Chinese thought”). In the beginning, only few educated Japanese were able to read Chinese but after a little bit, Chinese characters began to be used to also write Japanese. Naturally a rather big problem arose: the Japanese language already existed (even without a form of writing) and by importing Chinese characters, they also imported the Chinese pronunciation. For this reason, these days the same character can be read in different ways. In Japanese, the reading derived from Chinese is called on yomi, while the original Japanese pronunciation is called kun yomi. For example, the Chinese character 山 (which in Chinese is pronounced “shan” and means “mountain”), is also found in Japanese with two ways of saying it: in on yomi (derived from the Chinese) you say “san”; in kun yomi (the original Japanese pronunciation) you’d say “yama”. How do you know when to use on yomi or kun yomi? Generally speaking, if a character is alone in a phrase, it is usually read with kun yomi; if it is accompanied by other characters to form a composite word, it would be read with on yomi. The Japanese and Chinese therefore make use of the same Chinese characters, it’s just that in the Japanese system they have a different pronunciation. Moreover, while in China they exclusively use Chinese characters, in Japanese also use two spellings: hiragana (ひらがな) and katakana (カタカナ). To learn characters, the Chinese use the phonetic transcription system called pinyin, while the Japanese use furigana, or small hiragana characters placed above the character in question to indicate the pronunciation. Another common aspect between the two languages is the use of classifiers. When we want to firm numeric or quantitative expressions, such as “two books”, “three notebooks”, “five pens”, you have to use the number followed by a character that is conventionally called a classifier. There are tens and tens of classifiers that vary on the basis of the noun that they, obviously, must classify. For example, if we want to say “three books” you must have the number followed by a specific classifier for objects that can be leafed-through. Above all it must be said that the same character does not always classify the same type of objects, animals or people. For example, the character 匹 in Chinese is read “pi” and is used as a classifier for horses, while in Japanese you say “ippiki” or “hiki” (the pronunciation varies on the number present) and is used to classify small animals like cats. The second difference – which in my opinion is more revealing – is in the rule of use of classifiers which is different for both langauges. Number + Classifier + Noun. Here’s an example: 一只猫 (yi zhi mao), which means “one cat”. Noun + Particle が (ga)+ Number + Classifier. Here’s an example: 猫が一匹 ( neko ga ippiki), which also means “one cat”. Chinese and Japanese have different ways of forming questions. The most common (an perhaps most used) consists in inserting a “particle” at the end of an affirmative phrase. In Chinese, at the end of an affirmative phrase you insert the character 吗 (ma ); in Japanese you would insert the particle か (ka) instead. In Chinese and Japanese, the surname comes before the first name. Chinese names are generally formed by 2 or maximum 3 characters; the Japanese instead can even go up to 4 characters (actually, it’s a common practice). In both languages, titles and professions must follow the surname. In Chinese we have 王先生 (Wang xiansheng), which means “Mister Wang”; in Japanese we have 小林先生 (Kobayashi sensei), which means “Professor Kobayashi”. It is noteworthy that the word 先生 is pronounced differently and also has a different meaning! A first difference is in the structure of phrases. While Chinese is an SVO language (subject – verb – object), Japanese is an SOV language (subject – object- verb). Many scholars agree that the modern Japanese language is closer to classical Chinese than modern Chinese is. In fact it isn’t hard to find the SOV structure in classical Chinese. However, in modern Chinese there is a construct that anticipates the position of the object to the point of changing the phrase to SOV. I’m speaking of constuctions using 把 (ba). While Chinese has an “easy” and reduced grammar (when compared to English or Italian), The Japanese have a “difficult” and rather large grammar. In Chinese verbs and adjectives are not combined, in Japanese they are. A grammatical similarity is that both languages have a “theme-comment” structure. I would however like to make a point: to me one language isn’t more difficult than the others. There are just languages that are further off from our mother tongue and for this reason they’re more difficult to learn. Nevertheless, I would like to share John Pasden’s impression: according to him, if comparing the two languages, in the beginning it is harder to learn the Japanese grammar than the Chinese; while it is harder to master pronunciation of Chinese more than Japanese. Long term, the difficulty tends to “flip flop”. A colossal difference between the languages is the presence of tones in Chinese and their absence in Japanese. This is not just a difference that jumps out at your eyes (or ears), but it’s also something that makes learning and mastering Chinese pronunciation more difficult! As you have noticed, aside from a few similarities, Chinese and Japanese are two languages that stand on their own! I hope that the next time they ask you “what’s the difference between Chinese and Japanese?”, you’ll know how to respond handily, leaving the one asking you wide-eyed!